A woman was rushed to the hospital after being struck by a Metro train at the Greenbelt station at midday Wednesday, authorities said. The woman was struck by an inbound train as it arrived at the Greenbelt station. 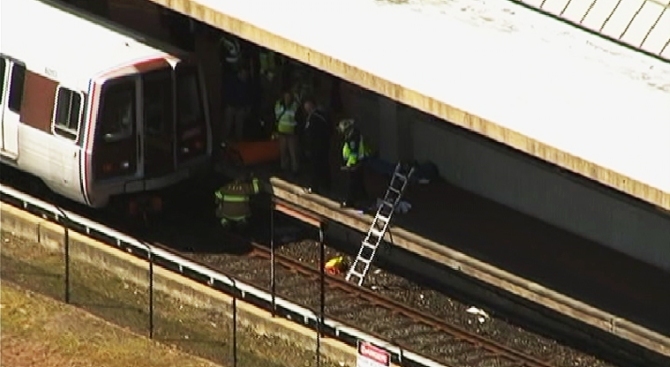 She was trapped under the train for nearly half an hour as Prince George's County Fire & EMS crews worked to free her. She was taken to a local hospital. Her condition is unknown. Metro officials said the woman intentionally jumped in front of the train as it entered the station. The Greenbelt station was closed for about an hour and a half while Metro Transit Police investigated; it reopened at about 2 p.m.
During the incident, Metro warned riders to expect Green and Yellow line delays in both directions. Metro operated shuttle buses between Greenbelt and College Park on the Green Line. Yellow Line trains traveled to and from Mount Vernon Square, rather than Fort Totten.